Preface. Introduction. Statistical Sensory Testing. The Analysis of Variance and Multiple Comparison Tests. Experimental Design. Incomplete Block Experimental Designs. Factorial Experiments. Response Surface Designs and Analysis. Shelf Life Testing Experiments. Nonparametric Statistical Methods. Sensory Difference Tests and Selection of Panel Members. The Method of Paired Comparisons in Sensory Tests. Appendix. References. Index. 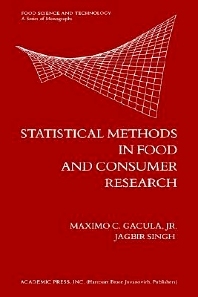 Food Science and Technology: A Series of Monographs: Statistical Methods in Food and Consumer Research focuses on the applications of statistical methods and specialized techniques in food and consumer research. The publication begins with a review of tools for statistical inference, statistical sensory testing, and analysis of variance and multiple comparison tests. Discussions focus on principles of experimental design, psychophysical aspects of sensory data, scales of measurement, distribution of sensory data, sample size estimation, and analysis of variance. The text then ponders on experimental design and incomplete block experimental designs. The book touches on factorial experiments and response surface designs and analysis. Topics include fitting of response surface design considerations, simple confounding and fractional factorial experiments, composite and rotatable designs, and response surface analysis approach for sensory data. The manuscript then examines shelf life testing experiments, nonparametric statistical methods, and sensory difference tests and selection of panel members. The publication is a dependable source material for researchers, instructors, and applied statisticians.